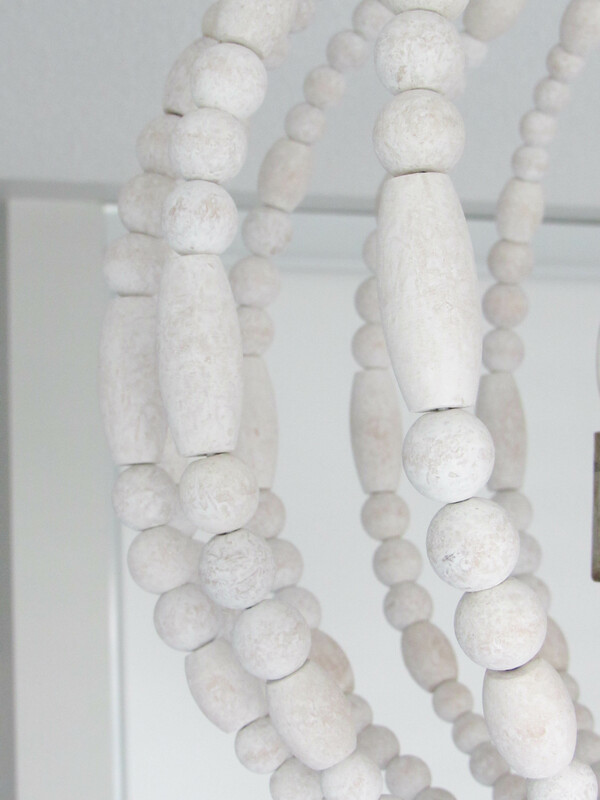 I am just putting the finishing touches on my daughter’s new big girl room, but I was so excited about her new wooden chandelier, I decided to dedicate a whole post on it. Plus, I thought you guys were probably dying for a sneak peek of her room, since I have been talking about it for so long. I have been dreaming of how this room was going to look for a very long time. The moment I found out I was having a girl, the wheels started turning as to how I was going to decorate not only her nursery, but her big girl room as well. 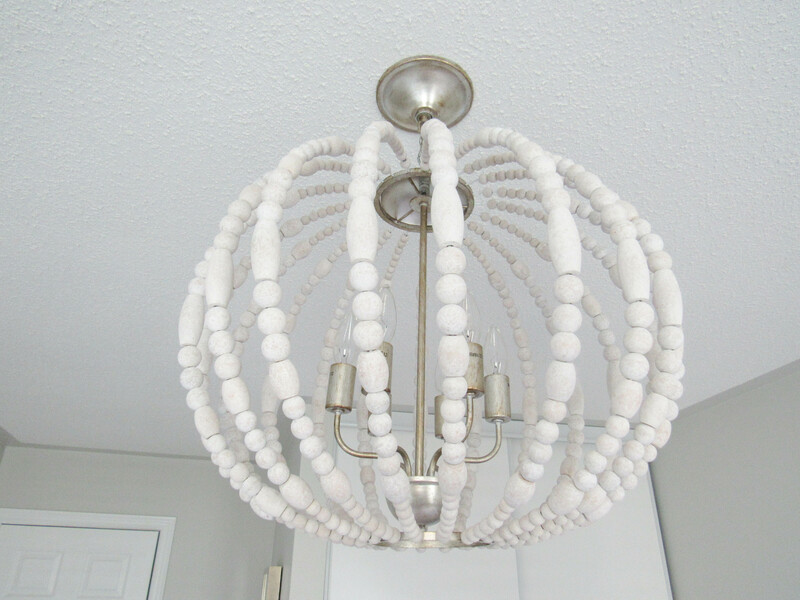 I remember saying to my husband at the hospital when she was first born, that I couldn’t wait to hang a chandelier in her room. I was just so excited to make a girly space. When it came time to changing the nursery into her big girl room, I knew I wanted to make it a space that would grow with her as she got older. I just didn’t want to have to re-do everything again in a couple of years. 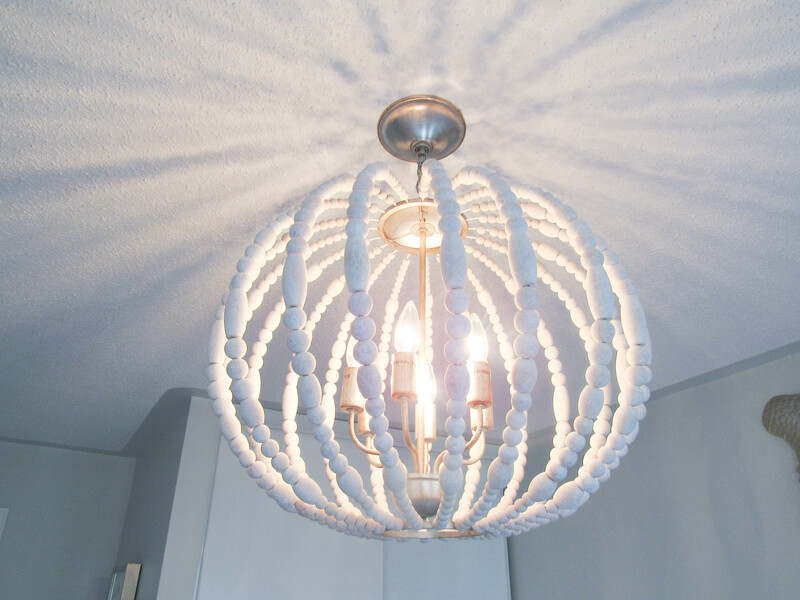 She started off with a cute little crystal chandelier in the nursery, but it looked a little juvenile for her big girl room, so I was on the hunt for something different. 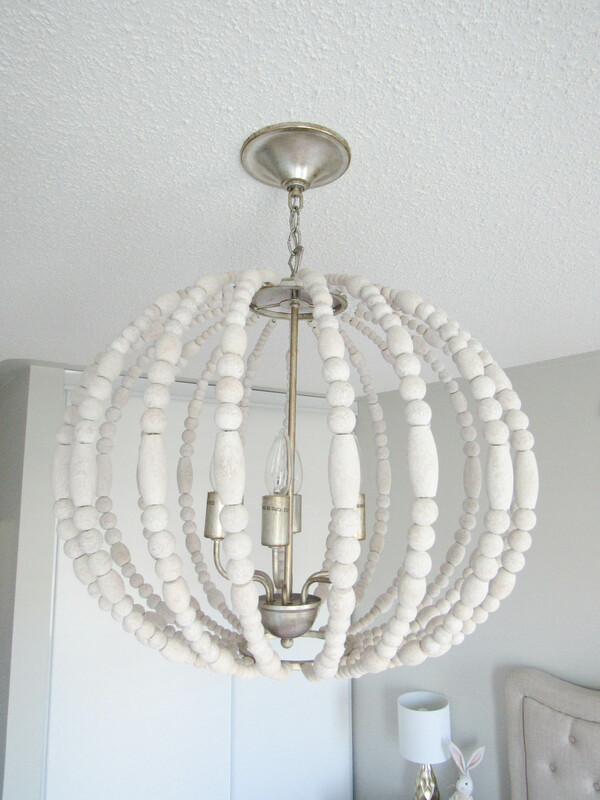 I had saved inspiration photos on Pinterest of wooden chandeliers, and decided to call Universal Lamp to see if they had anything similar. Not only is their service amazing, but they ALWAYS have what I am looking for. When I spoke with them on the phone they immediately asked for my email, and sent me 2 options to choose from. 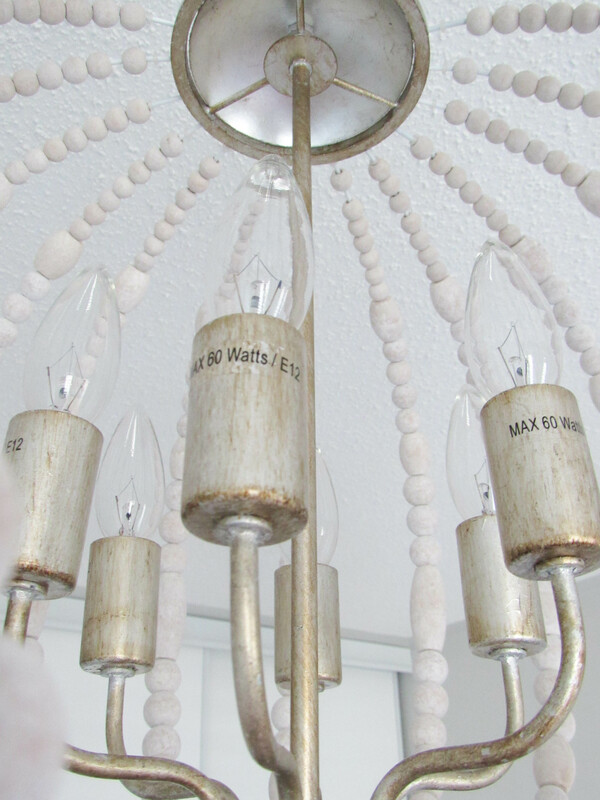 I decided on this 6 light wooden chandelier from Dainolite, and it couldn’t be more perfect! It was exactly what I was looking for, and looked just like what I envisioned in the space. 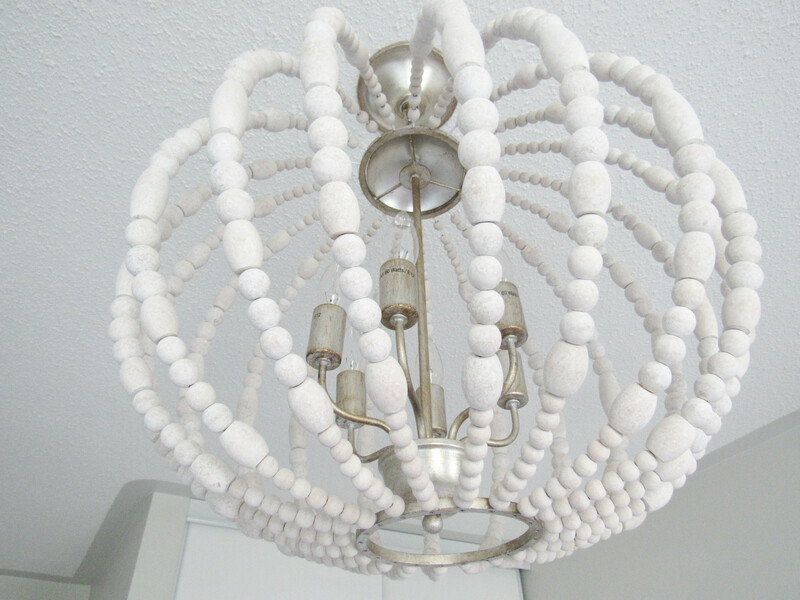 The white washed beads make the chandelier so soft, and elegant in the space which was exactly the look I was going for. It reminds me of Cinderella’s carriage which is one of her favourite movies. I love the palladium gold base as well, it’s a very soft gold that compliments the white beads so nicely, and works great with everything else in the space. 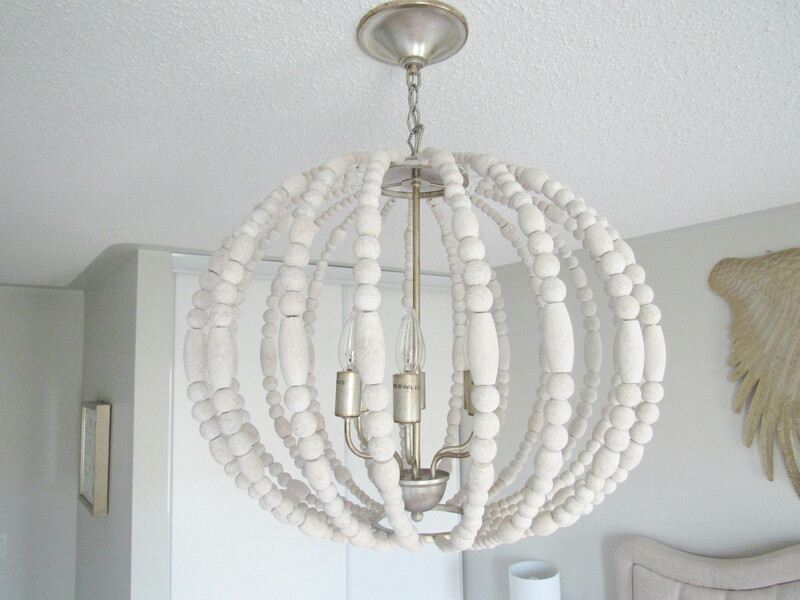 The chandelier measures 22” in height, and 21” in length, and fits the room great. Having 6 bulbs gives the perfect amount of light in the room as well. 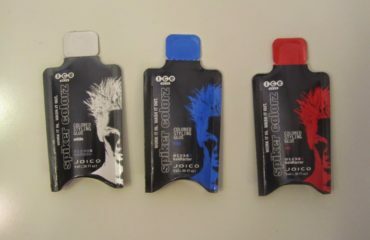 You can put max 60 watts in each, but we went with 40 watts. Putting the chandelier together was a breeze. 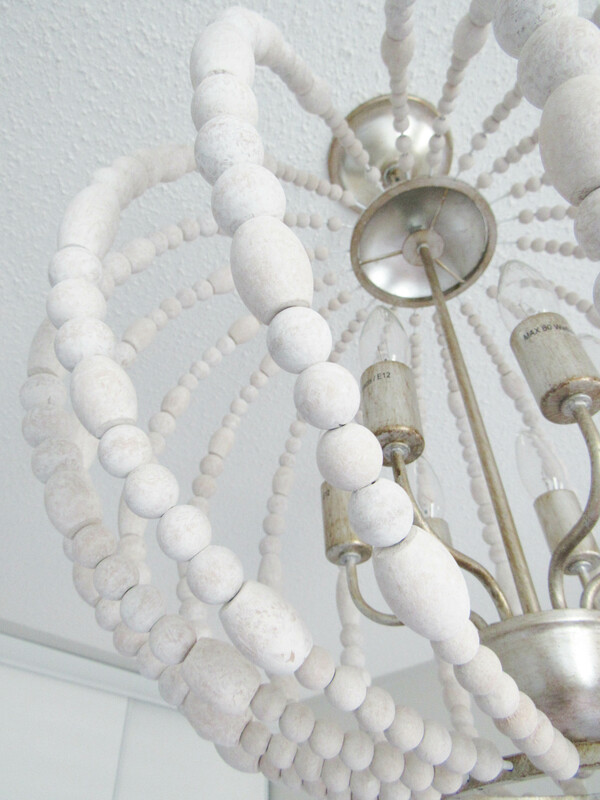 All the beads were already strung for us, we just had to secure each strand to the base of the chandelier, and hang it. Here is what the light looks like turned on. 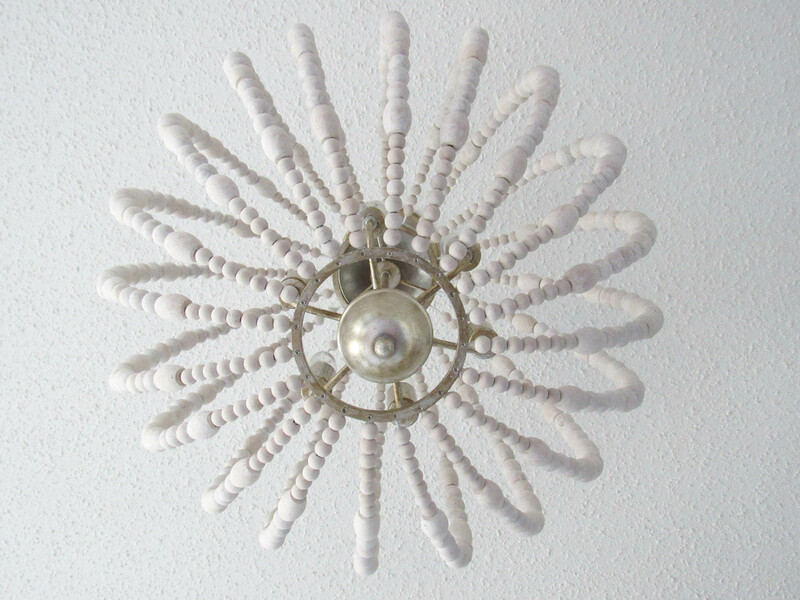 You can see it casts a beautiful design on the ceiling which my daughter loves to look at. 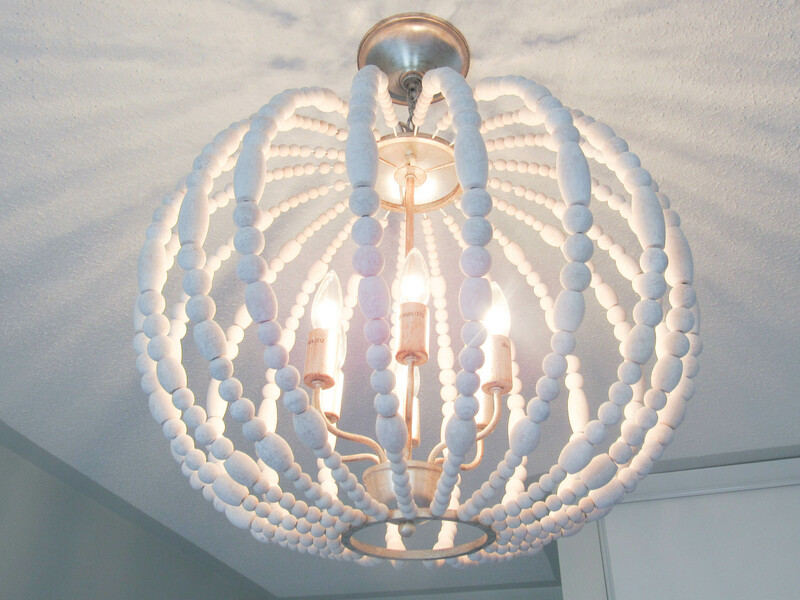 This chandelier looks gorgeous in her new big girl room! I am so excited to show you the reveal in a few weeks, so you can see a full shot of the room with the chandelier inside. I am just so happy with the way it turned out, so stay tuned! 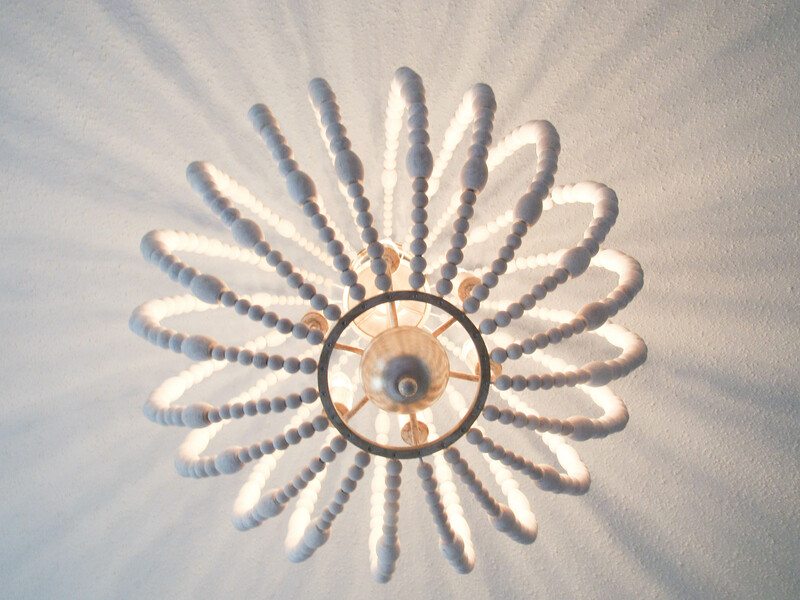 If you’re looking for new lighting for your home, check out Universal Lamp website here. You can also visit their showroom, they have a huge selection on display in their showcase. 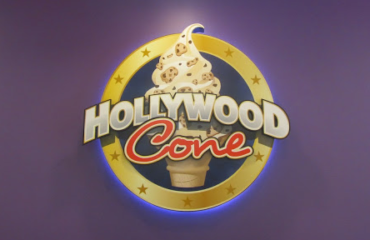 All the staff are so helpful whether you call by phone, or head over in person. 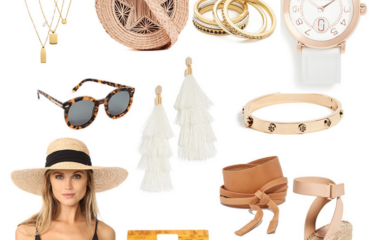 Disclaimer: Thanks so much to Universal Lamp for partnering with me on this post.